We’re sure you’ve heard that baked cheesetarts are causing dessert chaos around Melbourne and Sydney! Well Juliana Mare thought she would see what all the fuss was about. 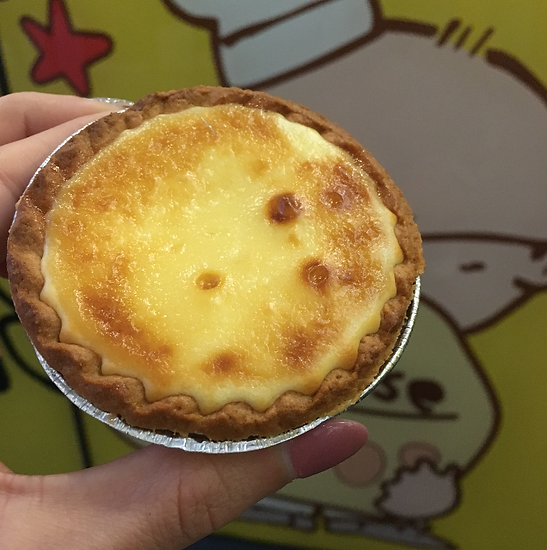 Unless you’ve been living under a rock recently, you would have seen the insanely popular Japanese Baked Cheesetarts that have been popping up all over social media! The palm-sized tarts with gooey centres and beautiful golden, caramelised surfaces are the latest foodie craze and masses of people have been queuing up to get their hands on one. Being the foodie that I am, I was excited to stumble across Uncle Tetsu’s while on my recent trip to Sydney. Famous for their Japanese Cheesecake and Triple-baked Cheesetarts, a visit to their store is a fabulous experience because thanks to all the glass windows, you can see the mass production and cooking process of their famous desserts. Viewing pleasure aside, let me start by saying that this is a very delicious tart! The pastry is crumbly and buttery and underneath the set top surface is a pool of the sweetest liquid, cheesy goodness. Not as creamy as cheesecake, runnier than lemon curd but thicker than cream – the filling is a unique texture of its own and I would happily buy and eat a pot of it on its own! Imagine the zingy and decadent flavour of a vanilla cheesecake, perhaps with a hint of lemon. But instead of being set like a cheesecake, it’s warm, more gooey than solid and wickedly sweet. Sweet enough in fact, that I split the one tart with two friends. Well, we attempted to split it, that is. Be mindful that after one bite or as soon as you break the tart open, the gooey insides will spill out, so slurp quickly, kids! So we’ve established the Cheesetart tastes amazing, so where does my issue lie? In the hype preceding my first taste. When you see dozens upon dozens of food bloggers raving about his incredible this new dessert is, your expectations inevitably rise. Then you have major publications like Goodfood, Broadsheet and The Urban List posting articles claiming that the snack game has been changed forever and that we should expect to queue when visiting the stores. Such big claims like this set the bar pretty high. I’m not going to pass up a Cheesetart in the future (you’d be a fool if you did because hot damn, they’re delicious!) but I’m also not in a rush to go buy another one and it certainly hasn’t defied my dessert standards. Long story short; ignore the hype, try it once and don’t rush for seconds. For more restaurant reviews and recipe ideas, check out Peaches & Push Ups and follow @juliimare on Instagram.